Fishing, hunting, feathers - translated into a wedding?? In this case, yes please! When planner Danae Grace first told us of some of these wedding details, we weren’t sure how it was going to come together, but let me tell you - this wedding was stunning and unique, not to mention a nice balance of feminine and masculine! Featured on The Knot, you’ll have to take a peak at this outdoorsman themed wedding. A few of their details can be seen below in photos by Jen Rodriguez. More photos and full vendor list can be found on The Knot! We’d be lying if we said we hadn’t been anxiously waiting for this wedding to pop up in a publication somewhere, so we were thrilled to see it up on 100 Layer Cake this morning! 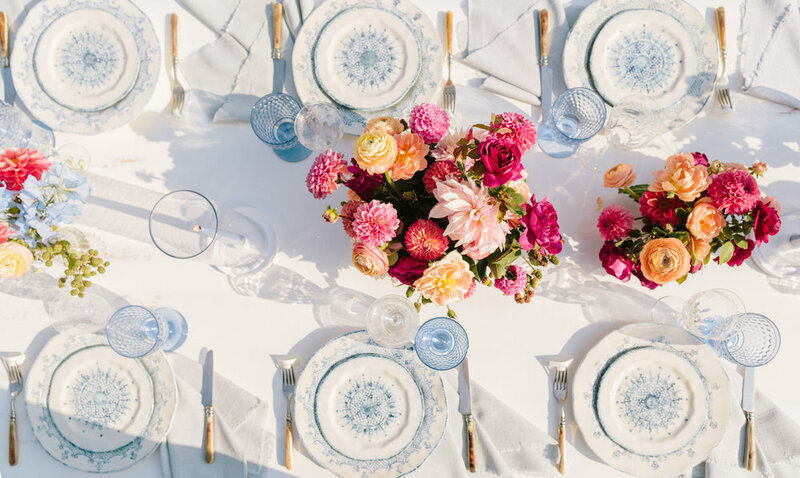 Green Ribbon Parties knocked this design out of the park - from a casual backyard bbq rehearsal dinner with Bear Market Riot, to a fancy floral wedding day array by Moon Canyon Design, to the cutest picnic style farewell brunch, this weekend was every bride, groom, and designer’s dream. The talented Field to Table team was there for all three days of food and festivities. Check out the full vendor list on Meghan + Pete’s article up on 100 Layer Cake! Up on Ruffled’s Real Weddings you’ll find Seamus + Ashlee’s fun and green spring wedding. This couple kept it light and simple with green and white florals, ferns, and pampas grass from Noonan Designs. Avenue Twelve set them up with cozy cocktail lounges and a custom made dessert display, upon which Paper Cake Events displayed the yummiest dessert assortment. Check out more on the Ruffled Blog! Full vendor list can be found there or on the Greengate website Real Weddings page.